This is one of those special dinner recipes that comes together so quickly, and yet somehow still tastes like a restaurant quality meal. This dish is a one-pan wonder. 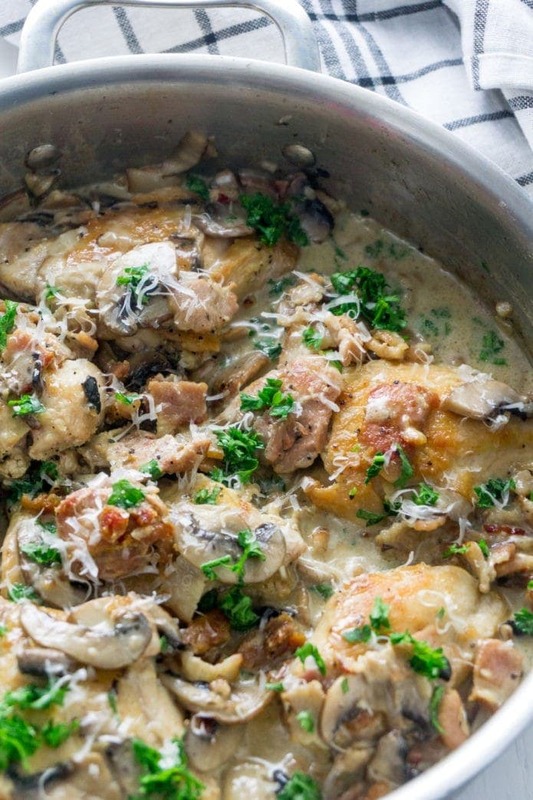 Chicken thighs are browned and simmered in a rich sauce of heavy, mushrooms, garlic and bacon. Did I mention the bacon? 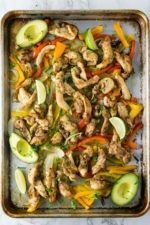 You are going to love this recipe because it tastes rich and luxe — but is still easy enough to make on a weeknight. 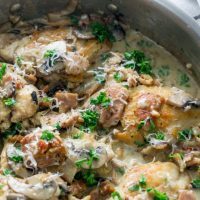 This creamy mushroom chicken recipe is your next favorite keto chicken recipe. This 9 ingredient recipe starts with skinless boneless chicken thighs. Could you use skin-on or bone-in chicken thighs? Sure! For me though, I love how quickly the boneless pieces cook — and I’m all about saving time in the kitchen. So, do you have 30 minutes? Great. You can make this dish because it is not fancy. Does it taste like it came from a restaurant? Yes. Can you make it at home? Yes! 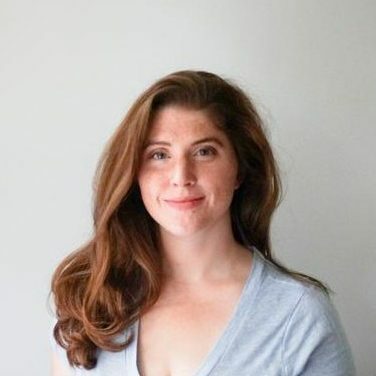 Chicken thighs, the hero of this story. Bacon. Sugar free and uncured, if you can find it. Mushrooms. 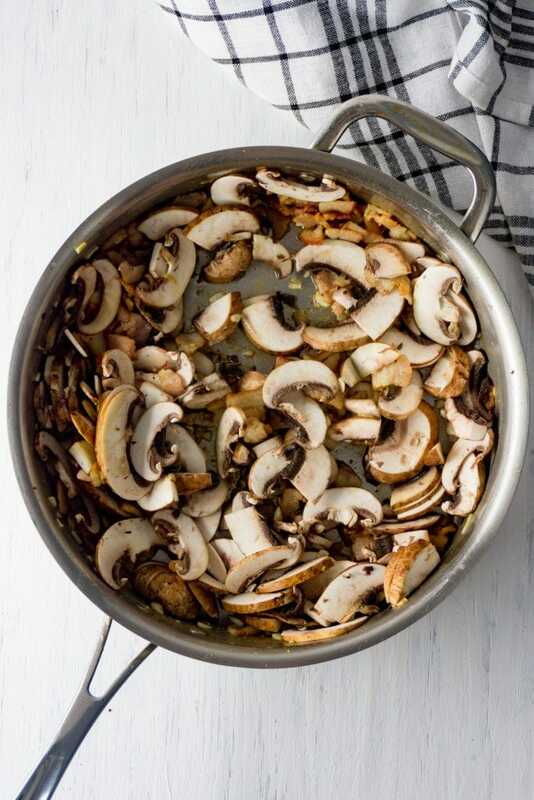 I like cremini in the recipe, but regular button mushroom are still wonderful. Heavy cream and fresh Parmesan. Bring on the dariy. Salt, pepper, and parsley to garnish. As you do. First, we season the chicken thighs with salt and pepper on both sides. Then, we’ll cook the chicken in a large skillet over medium-high heat. Cook the chicken 5-7 minutes until the first side is golden brown. Flip pieces and cook the other side 3-5 minutes until it is golden brown as well. At this point, your chicken thighs should be cooked through. I like the take the internal temperature, just to double check. If you do too, your thermometer should register 165. Once the chicken thighs are done, remove from skillet and set them aside while you make the sauce. Using the same skillet, cook the bacon until it just begins to crisp. Go ahead and scrape up all those brown bits — which will give the sauce such good flavor! Add the garlic and mushroom, and then pour in the cream and Parmesan. Simmer and stir for about 2 minutes. We’re looking for the sauce to bubble and thicken slightly. Add the chicken back into the pan, stir into the sauce, and garnish with parsley and shaved or grated parmesan, if desired. 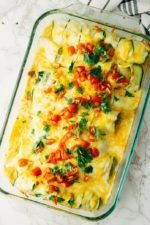 This would make the entrée to serve with a simple green vegetable tossed in olive oil. 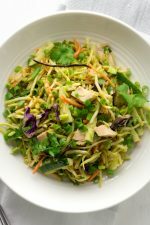 Try it with roasted broccoli, kale salad, or simple pesto zoodles. 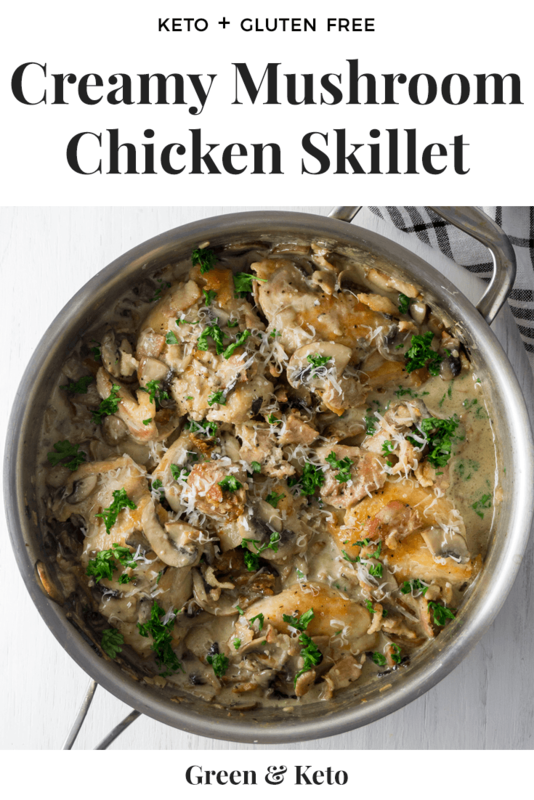 I’m sure this Healthy Mushroom Chicken Skillet recipe will be a dish that you will want to add to your family’s menu often. Heat a large skillet over medium-high heat. Cook the chicken 5-7 minutes. Flip pieces and cook the other side 3-5 minutes until golden brown, and cooked through. Internal temperature should register 165. Once the chicken is done, remove from skillet; set aside. Using the same skillet, cook the bacon until just beginning to crisp. Add the garlic and cook, stirring frequently, about 1 minute. Add in the mushrooms and cook until mushrooms begin to soften. Pour in the cream and Parmesan, stirring frequently, until slightly thickened, about 2 minutes. Add the chicken back into the pan, stir to coat. Garnish with parsley and shaved or grated parmesan, if desired.